Last month's fifth Wednesday post over on the blog discussed what it would mean to experience the forces of nature as persons rather than things, and a fair number of people expressed interest in trying to meet the world that way. It so happens that I've been reading up on the religious life of late classical Paganism, for a book project currently under way, and realized that I should have mentioned a habit of that time that I picked up quite a few years ago. There was a traditional gesture of respect that people in classical times did in the presence of the holy; you did it, for example, when you went into a temple and stood before the divine image there. It was quite simple: you kissed the palm of your hand, and then held the hand with the palm toward the holy presence. You could add a prayer or what have you, but the straightforward physical action was enough. 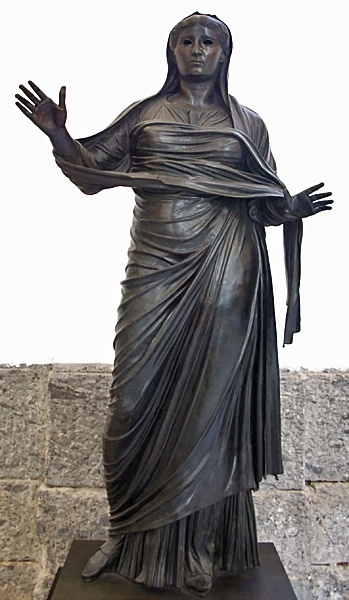 There are still plenty of bronze votive statues around of Greeks and Romans making the gesture -- those were put inside temples to offer perpetual recognition to the gods. In late classical Paganism, as spirituality merged with philosophy and people became aware that (as Thales put it many centuries earlier) all things are full of gods, it became a common habit among the devout to make the same gesture every morning when they first saw the Sun, and whenever in the cycle of the day and night they first saw the Moon. In the final golden autumn of the classical Pagan world, reverence for Helios the Sun, Selene the Moon, and the other visible powers of nature became very common, and what we may as well call the ecological dimension of such rites as the Eleusinian mysteries -- their connection with seasonal cycles and the life cycles of vegetation -- were increasingly central to the celebration of the rites. Directing the old token of respect toward Sun and Moon was a part of that refocusing. Many years ago, when I first read of that custom -- I think it was in the pages of Walter Burkert's magisterial volume Greek Religion -- it struck me as a very good idea, and I started doing it. I still do it. It can be done quietly, even surreptitiously, as I imagine Pagans did it to avoid being noticed and beaten or worse by Christian mobs, but it makes a connection, and acknowledges Sun and Moon as living and holy beings rather than dead things. (Mind you, late classical Neoplatonic Paganism in general has always seemed profoundly sane to me, but that's a topic for another time.) But I'd encourage those who want to live in a living world rather than a dead one, a world full of gods rather than a vast lifeless machine clanking its mindless way through time, to consider trying this simple respectful observance. It may lead you in directions you don't expect.